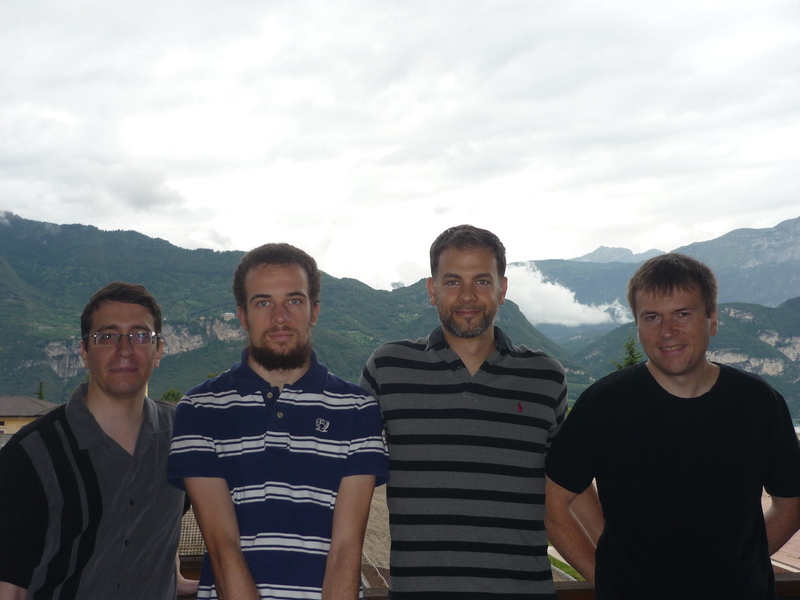 Bruno Giacomazzo, Andrea Endrizzi, Riccardo Ciolfi, Wolfgang Kastaun share details of their latest research published in the CQG focus issue: Rattle and shine: the signals from compact binary mergers. From left to right: Bruno Giacomazzo, Andrea Endrizzi, Riccardo Ciolfi, Wolfgang Kastaun. About the authors: Bruno Giacomazzo is an assistant professor at the Department of Physics of the University of Trento and the Principal Investigator of the numerical relativity group there. The group is currently composed of two postdocs (Riccardo Ciolfi and Wolfgang Kastaun) and two PhD students (Andrea Endrizzi and Takumu Kawamura). At the end of 2013, after seven years spent abroad (between Germany and the USA), Bruno Giacomazzo came back to Italy for an assistant professor position at the University of Trento in Northern Italy. He used to come to this region when he was a kid to hike or ski on the mountains, but he never thought he would have come back here to study neutron star mergers. Thanks to financial support from MIUR (Ministry of Education, University, and Research) he was able to attract Riccardo Ciolfi and Wolfgang Kastaun from abroad and to create with them the first numerical relativity group in this part of Italy. Thanks to our efforts and to the support of INFN , PRACE, and CINECA, we were able to start our own investigations of binary neutron star mergers, focusing on the effects of magnetic fields and different equations of state, short gamma-ray bursts and gravitational wave emission. The first paper authored by all the members of our group has been recently published in CQG and many others are coming in the following months (also in other journals). Our latest CQG paper started as a Master thesis project for the youngest member of our group (Andrea Endrizzi). He defended his thesis in 2014 and started a PhD here the following year. With some help from the rest of our group, he ran a series of simulations of binary neutron star mergers using our fully general relativistic magnetohydrodynamic (GRMHD) code, Whisky. The simulations included also the first study in GRMHD of unequal-mass systems with a piecewise polytropic equation of state. We considered both systems forming a black hole a few ms after merger as well as systems producing long-lived neutron stars. For all models we provide a detailed description of the gravitational wave signals, magnetic field evolution, and matter dynamics, including formation of disks and matter ejection. Movies from our simulations, initial data, and gravitational wave signals are publicly available on the CQG webpage. Our group is currently working on implementing neutrino emission and absorption in the Whisky code as well as working on including different finite temperature equations of state. We also actively collaborate with the Virgo Data Analysis group of Giovanni Prodi here in Trento to understand whether Virgo and LIGO could detect post-merger gravitational wave signals and how to improve detection algorithms for this purpose. Future detection of gravitational waves from the post-merger phase of binary neutron stars, combined with simulations such as ours, will help to ultimately unveil the inner structure of neutron stars. We also work on better assessing possible electromagnetic emission, such as short gamma-ray bursts, from the merger of binary neutron stars and their dependence on different neutron star properties (such as, magnetic fields, equations of state, masses and mass ratios). And don’t forget to watch our video abstract! This entry was posted in Author Insights, IOPselect and tagged gravitational waves, numerical relativity, relativistic astrophysics by Adam Day. Bookmark the permalink. Adam Day is the former publisher of Classical and Quantum Gravity. His background is mostly in publishing, where he thoroughly enjoyed working with the gravitational physics community. He now works as a Data Scientist for SAGE Publishing.